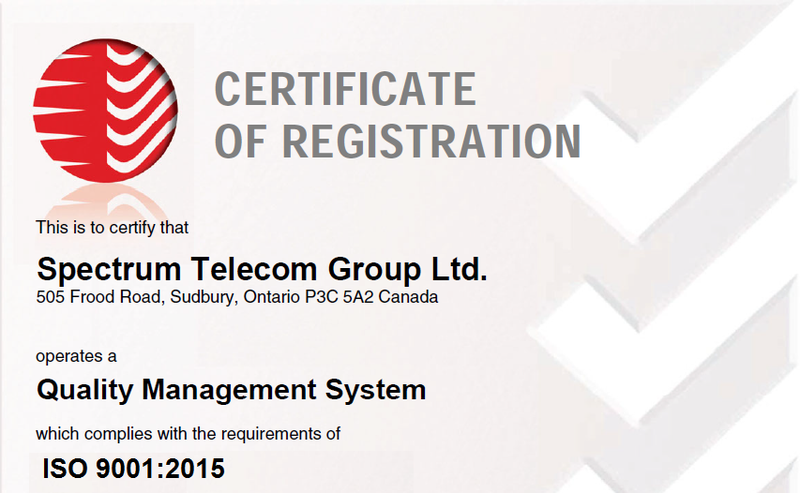 Spectrum Telecom, an ISO accredited company, located in Northern Ontario, announced the completion of their annual ISO 9001:2015 quality audit performed by SAI Global for their Sudbury Branch Operations. This year marked a new registration year as the standard was updated in 2015 to reflect new changes in the standard, many of which that were contributed by Fortune 500 companies. Having our test equipment regularly calibrated and making sure our technicians are following quality processes and policies is just part of our Quality Management System. “Quality is ingrained in your business” was the comment our ISO auditor recently made about our focus on quality. This comment was in respect to what we were already doing to maintain the highest level of quality we can for our customers. By doing so, many of the new standards included in the 2015 revision were already being met by our organization. Risk assessment, management of change and strategic planning are all core components of our business. Our customers rely upon our products and services every day to keep them safe and productive. Our customers in public safety trust us to maintain their P25 Digital Radio Networks to ensure they are connected in times that matter the most. Likewise, Mototrbo Digital Radios are being used to help employees work safely throughout Northern Ontario in industries such as Mining, Manufacturing, Forestry, Transportation and Utilities. You have a choice when selecting a two way radio service provider, by selecting Spectrum Telecom, you are selecting one that puts Quality first.